The 5-string kantele is a rather plain little folk harp. Like bread without sugar it is an instrument of economy. No extra frills here. No filigree or jewel-work. Just wood and metal. This is the kantele I take to the lake. Sit on the dock. Rock in a boat. It rides my shoulder as I walk the night wood, an answer to the starlight spilling its milk over the midnight aspen. It rests precariously on a rotting log while I hunt for wild flowers in the mud. It passes aging hands at the nursing home, comes out of my pack when I'm stuck at the airport. It bounces and slides around in the back of my tiny Japanese car as I drive across country from gig to gig. And enters my semi-sonambulant hands as my husband pulls our car into a gas station for re-fueling. It takes the enthusiastic abuse of the countless sticky fingers of five-year-olds as they pluck and strum furiously searching for a bigger sound. Big is not a sound you will get from this wooden box. It is more like the threading of sighs, wind over wild grass, a way of coaxing joy from silence, a way of mastering grief. It is the truest song of solitude. But also the reckless tumbling of cool water over heavy stones, the tinkling circlets of sound lifting from a bird nest. I play my kantele on stage in the most blinding of light and all alone when it is so dark, a hand raised inches from my face can not be seen. 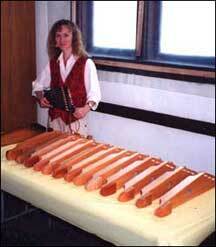 And this is when I like my kantele best. When I'm all alone. No one listening, except for my overfed cats who come and sit close by when I play. For this is a way for me to slow down the day. In the quiet center of my day the kantele is for me not only song, but speech, dance, healing, rejoicing, memory, and like a bird; uplift, balance -- flight.